The Great Famine Voices Roadshow is a series of open house events in the United States and Canada that brought together Irish emigrants, their descendants, and members of their communities to share family memories and stories of coming from Ireland to North America, especially during the period of the Great Hunger and afterwards. A selection of these family memories and stories has been made freely available on this Great Famine Voices online archive. 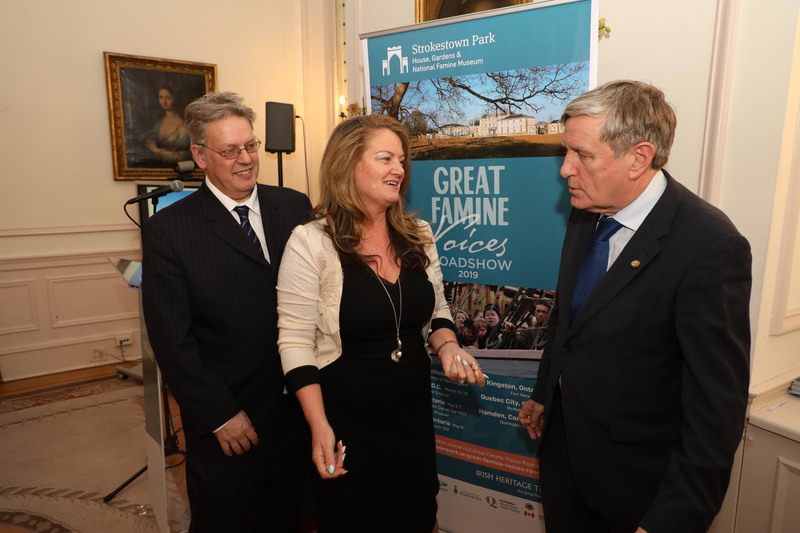 The Great Famine Voices Roadshow in the USA and Canada is hosted by the National Famine Museum at Strokestown Park, Ireland, and the Irish Heritage Trust, an independent charity. The Roadshow is held in partnership with Ireland’s Great Hunger Institute at Quinnipiac University, the University of Toronto, and the ADAPT Centre at Trinity College Dublin. It is funded by the Government of Ireland Emigrant Support Programme. 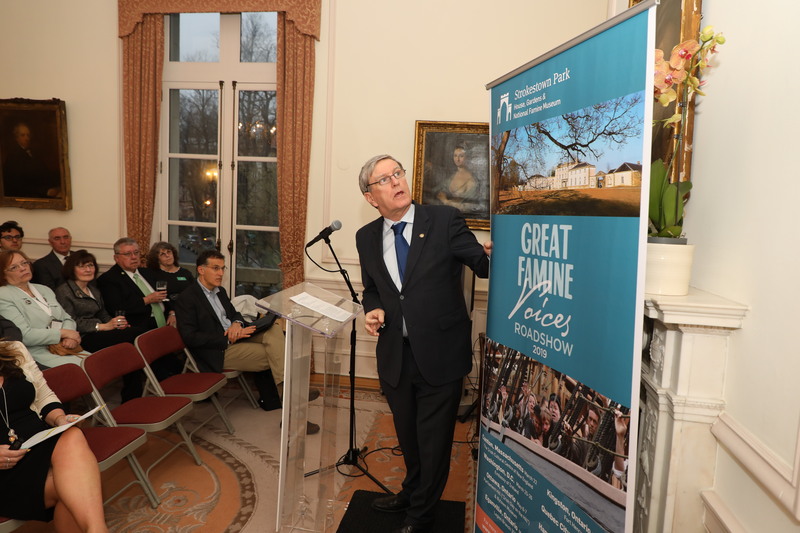 Ambassador Daniel Mulhall, Great Famine Voices Roadshow 2019 Launch, Embassy of Ireland, Washington DC. Great Famine Voices Roadshow 2019 Launch, Embassy of Ireland, Washington DC. From left: Jason King, Caroilin Callery, Ambassador Daniel Mulhall. 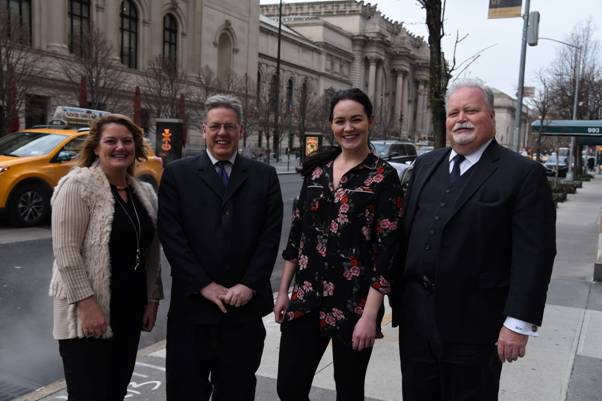 Caroilin Callery and Jason King (Irish Heritage Trust), Sophie Colgan and Brian McCabe (American Irish Historical Society). Strokestown Park House, and (btm), participants of the 2017 National Famine Way walk at the Jeanie Johnson famine ship in Dublin. 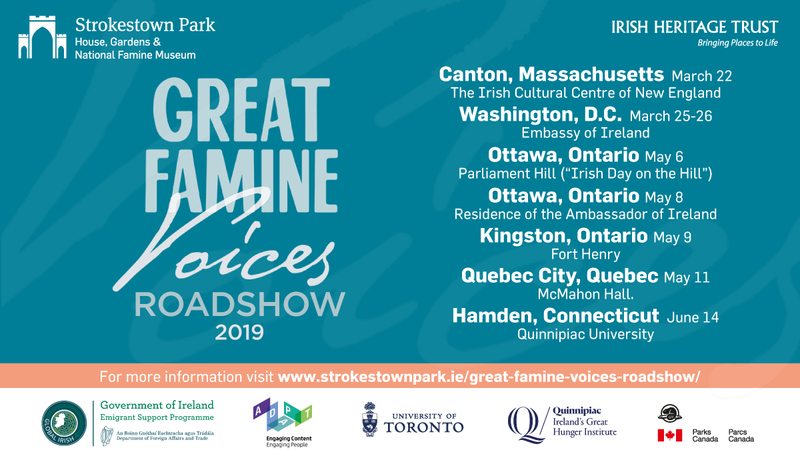 The Great Famine Voices Roadshow is inspired by the search for the 1,490 former tenants who were forced to emigrate to North America from the estate of Major Denis Mahon at Strokestown Park, now the site of the National Famine Museum, at the height of the Great Famine in 1847. The descendants of these emigrants are now being traced by Professor Mark McGowan and his research teams at the University of Toronto. The story of the 1,490 can be found at this link. According to Caroilin Callery, a Director of the National Famine Museum in Strokestown Park, Roscommon: “This Roadshow has provided a unique opportunity for Irish-Americans and Irish-Canadians to share their stories, strengthen their sense of ancestry, and historical and current Irish connections. Over the past few years, we have been in search of stories from ‘the next Parish’ in North America, where so many of those who survived the Great Hunger – the biggest catastrophe of 19th century Europe – made new lives. We need to hear these stories,” she continued.